To follow up on my recent post about great diatonic solos on the the blues progression, this current post is about solos that alternate between using the G 7th scale diatonically and occasionally adding the half step between the root and 7th of the scale. The two solos I look at in this post are evidence that the melodic language of bebop is a mainstay within the constantly evolving tradition of jazz: although they were played almost forty years apart, both solos make fresh use of similar melodic material. The first solo is by my friend and colleague Ray Vega, a trumpet player who, among many other accomplishments, has had long associations with many of the giants of the Latin jazz world including Tito Puente and Ray Barretto. 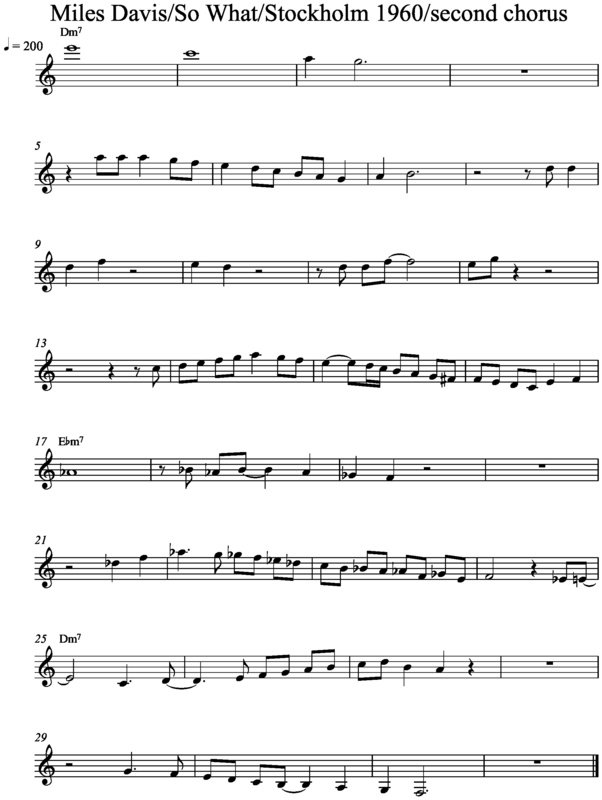 For this blog post I’ve transcribed Ray’s second chorus on ‘Sister Sadie’ from the album ‘Silver In The Bronx’ by The Bronx Horns. Before I discuss the solo, I think it might be helpful to explain ‘Sister Sadie’ by comparing it to a similar tune, Miles Davis’ ‘So What’. The form of ‘Sister Sadie’ can be challenging to a soloist in the same way as the form of ‘So What’, as both tunes are in a 32-measure AABA form and use only one chord in the A sections (Dm7 in the case of ‘So What’, G dominant seventh in the case of ‘Sister Sadie’.) The bridges of both tunes have a similar harmonic openness: the bridge of ‘So What’ is based entirely on an E flat minor seventh chord, and the bridge of ‘Sister Sadie’ mainly introduces a C dominant seventh chord. By the time they composed these tunes, Miles Davis and Horace Silver were familiar with and had recorded many tunes with 32-bar AABA forms (including a number of tunes with the Rhythm Changes progression), and so one reason ‘So What’ and ‘Sister Sadie’ must have come about is that Davis and Silver needed an improvisational vehicle that was not yet available to them: a tune with the familiar thirty two bar length but which contained longer stretches of a single chord. When I think of how many times I’ve heard improvisers get lost on the form of a tune like ‘So What’ or ‘Sister Sadie’, it reminds of the time when I was on a long drive from my home in Vermont to a summer job in southern New Jersey. I ended up driving into Delaware because all the rest stops on the New Jersey Turnpike looked the same to me. Okay, well, listening to some great music probably had something to do my geographic confusion, too (around that same time I made a conscious choice to stop listening to Ya Yo Me Cure by Jerry Gonzalez and the Fort Apache Band in the car, largely because of Hilton Ruiz’ amazing piano playing on ‘Caravan’ and its effect on my driving.) In any case, as I’ve done the same drive to south Jersey many times over the years – first to a summer camp where I worked, and now to my in-laws’ house – I’ve learned to avoid getting lost by taking breaks to check my directions, and paying attention to as many different kinds of changes on the road as I can find – exit signs and mile markers, as well as watching the clock. As Ray Vega’s solo on ‘Sister Sadie’ demonstrates, paying attention to landmarks and taking well-placed breaks are also crucial elements of an effective solo over a 32 bar modal form. In the gigs I’ve played with him, I’ve always been impressed with how Ray Vega can take all kinds of chances when he improvises, reap all the benefits that calculated risk-taking can bring, and never lose the form of a tune even once. Transcribing his solo on ‘Sister Sadie’ has reminded me of some of the reasons why he’s able to be so adventurous and fearless at the same time: he is a master of phrasing and can play very economically when he chooses to, carefully adding to and subtracting from the pitch collection he uses. His second chorus on ‘Sister Sadie‘ creates variety by alternating between phrases using only notes of the G seventh scale and phrases that add the half step between the root and the seventh of the scale. He also alternates effectively between eight-measure and four-measure phrases, leaving space in between them. (By contrast, many of the times I’ve heard soloists get lost on the form of a tune like this, their playing has either been non-stop or phrased with seeming randomness; in both cases, they don’t leave the kinds of pauses that would allow them to hear important ‘landmarks’ in the accompaniment. I learn more all the time about how to take these kinds of re-orienting breaks in my own solos; the spaces that Ray leaves in his solo are a great model of this sort of break.) 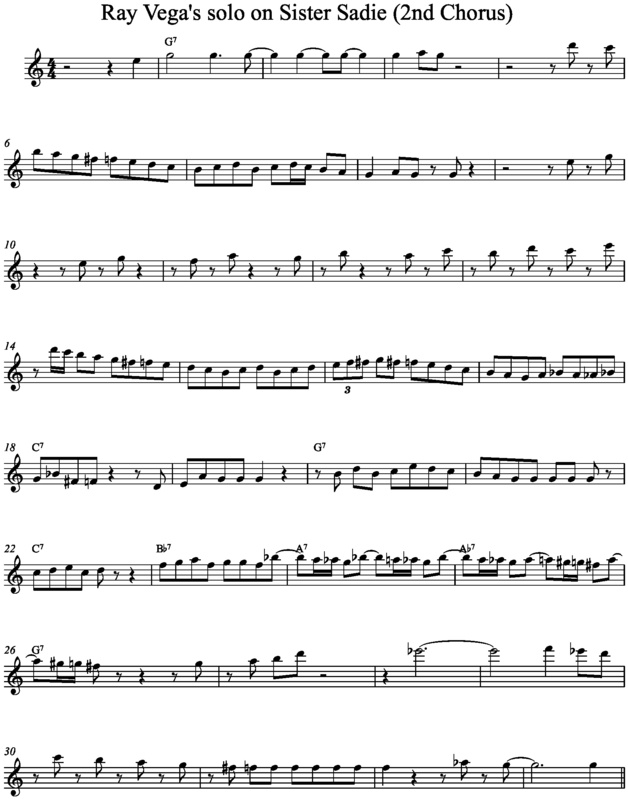 The half steps that are the focus of this post come in measures 6, 14 and 16, where Vega makes a classic bebop use of the half step: as a passing tone placed on the upbeat (i.e. the second of a pair of eighth notes or the third note of a triplet) in scalar eighth note passages. Ray Vega’s solo, by contrast, uses the root a fair amount but maintains a sense of forward motion through repeating it with many different rhythmic motifs. As he plays a phrase leading out of the bridge and into the last A section, Ray ends the phrase on the note F sharp over a G seventh chord. This move in Ray’s solo sounds completely natural and right, illustrating a point that my first improvisation teacher, Yusef Lateef, made many times. I took his class at least twice, and I remember at the beginning of both semesters, he began by making the point that both seventh scales AND major scales can be used to improvise over dominant seventh chords. This principle can be seen many times in Charlie Parker’s solos over various blues progressions, including solos as iconic as ‘Billie’s Bounce’. Many of these solos show that one way to make the seventh of the major scale work when using it over a dominant chord is by placing it at the beginning or middle of a phrase, rather than making it the goal. Ray’s effective use of the major seventh at the end of phrase illustrates another way to make that scale degree work. Perhaps it is Ray’s repeated use of the F# on the upbeat at the beginning of the solo that makes his use of it on the downbeat of m. 26 so pungent and swinging. On the other hand, Ray does resolve the major seventh with the first note of his next phrase before going on to focus on the flat thirteenth (a.k.a. the sharped fifth, or in Barry Harris terms ‘the half step between the fifth and the sixth), a half step which I am hoping to focus on in a future post. One point I’m trying to make in my choice of soloists in this blog is that while great soloists of the past are of course crucial to study in learning an improvisational language, it is just as important to study current players and those in the music scene near you. This is the reason that my first blog post included an exercise based on a lick by the keyboardist Mark Mercier of the long-standing New England band Max Creek. I hope to include more great current players of the local and international scenes in future posts. Funny thing is : a major scale already has 2 half steps. which makes 3 with the added one between the root and 7th of a G7. There should be a name for what you are doing in the field of musicology. You are putting into words/giving language to what is being played. It’s somewhat analogous to what theologian Gustavo Gutierrez does for biblical interpretation.